Princeton University Press has launched its iPad app version of the Barrington Atlas of the Greek and Roman World, as we noted here on Oct. 31. The app has been made available for $19.95 on iTunes. The Barrington Facebook page includes recent news and reviews about the release. Princeton provided a copy of the app for this review. Testing was done on a 4th-generation 128 GB iPad running iOS 7.0.4 after a clean restart. When the print version of the Barrington Atlas was published in 2000, the fruit of a multiyear international collaboration, it redressed a problem that had bedeviled the latter 20th-century: a lack of up-to-date, accurate, and visually informative/attractive (yes, I link those two attributes) maps for the classical world. Murray’s Small Classical Atlas, a short but distinguished accomplishment of Victorian cartography popular in schools, had seen its last update in 1917 (though reprints appeared through the 1950s). The efforts of van der Heyden and Scullard (1962) and Hammond (1981) were useful as references, but their visual qualities (too few maps, and those reduced to atopographic colored line-drawings in the former; sepia monochrome in the latter) left much to be desired. The Facts-on-File Cultural Atlases released from 1980-1990 (“Greek World,” “Roman World,” “Egypt,” and “Mesopotamia and the ancient Near East”) were examples of the encyclopedia-style that prevailed in that decade, with lots of insets, photos, short descriptions, timelines and essays — an integrated approach that had many merits, but which were ultimately limited in sheer cartographic utility. These intensive courses are intended to provide graduate students and other professionals in archaeology, history, classics and historic preservation (plus occasional upper-level undergraduate students) with hands-on training in skillsessential for contemporary practice. With opportunities to put into practice skills learned during the course, these courses are taught by specialists in the field and are offered in rotation in sequential years. In collaboration with ETH Zurich (Institut für Denkmalpflege und Bauforschung, Prof. U. Hassler) and the Sovrintendenza Capitolina ai Beni Culturali. Architectural remains represent the largest and most conspicuous body of material evidence for the study of Antiquity. At the same time, ancient buildings are fragmented and highly modified artifacts with long life cycles of construction, decay and reconstruction. The analysis and documentation of ancient buildings is thus an opportunity to understand buildings in time, to make sense of them as social and historical artifact and to address the issues of interpretative documentation and recording of the past. 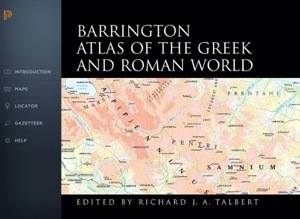 On November 21, Princeton University Press will launch an iPad app version of the Barrington Atlas of the Greek and Roman World. See the press release below; there’s also a slide show of screenshots on the web site: http://blog.press.princeton.edu/barrington-atlas-of-the-greek-and-roman-world-app-available-november-21-2013/. The upshot is that the complete content of the Barrington Atlas (100+ color maps of the ancient world), is available, but with integrated navigation and search functions. The American Numismatic Society and the Institute of Archaeology of University College London, UK, launch an important new tool for the analysis of Roman Republican coin hoards. Coin Hoards of the Roman Republic Online (CHRR Online) is a collaboration between Rick Witschonke and Ethan Gruber at the ANS and Dr. Kris Lockyear of UCL.